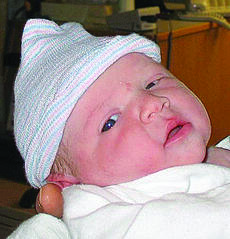 James Joshua Muntz was born to Eric and Julie Muntz of Fort Thomas on Feb. 6, 2009, at Bethesda Hospital North in Cincinnati. He weighed 7 lbs., 15 oz., and is welcomed by his sister, Becca Muntz. Maternal grandparents are Dan and Debbie Mullikin of New Richmond, Ohio. Paternal grandparents are Lewis and Cathy Muntz of Cynthiana. I suspect most of you have no idea about the person and the saintly episode that is commemorated each Feb. 14 by friends, family and most importantly, lovers. In fact, there are several versions of how the most romantic Saint became a commercial success. One story about St. Valentine has its origins in third century Rome where the Emperor Claudius II outlawed marriage for young single men because he valued them more as young warriors. A priest by the name of Valentine defied the law and continued to secretly marry the young soldiers who were in love. 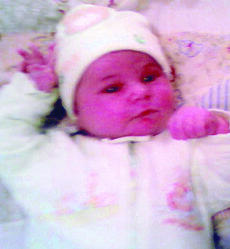 Alyssa Jo Rice was born to Bradley Aaron and Ashley Marie Rice of Cynthiana on Jan. 25, 2009 at Georgetown Community Hospital. She weighed 8 lbs. 4 oz. Maternal grandparents are Susan Moore of Cynthiana, and David Moore of Lexington, Ky.
Paternal grandparents are Donna and Chester Knipp of Cynthiana, and Floyd and Monica Rice of Cynthiana. February is “Heart Month” in Harrison County and the Harrison County Go Red for Women committee wants your help in “Painting This Town Red.” It’s easy, all you have to do is decorate your store windows in red or illuminate your homes and businesses with red lights. Let’s get Cynthiana listed on the national Go Red website by showing our support. Births announced this week are: Brent Allan Crump, Jan. 29, son of Kellar and Faye Crump; Stephen Farrell Hillenmeyer, Feb. 5, son of Paul and Mary Hillenmeyer; Presley Dennis Jackson, Jan. 26, son of Dennis and Deena Jackson. The Cynthiana Post Office announces that a toll-free number is available for all zip code inquiries. The number is 1-800-275-8777. The service is provided nationally through the U.S. Postal Service. Information available are rates and mailing, change of address, and local post office hours and locations. The Harrison County Extension Office and the Harrison County Beef Cattle Association will be sponsoring a meeting on “Estate Planning for the Farm Community.” This meeting will be held at the Harrison County Extension Office on Tuesday, Feb. 17 beginning at 7 p.m. Light refreshments will be served. The speaker will be Keith Jefferies who is a tax expert and a member of the Henry County Beef Cattle Association. 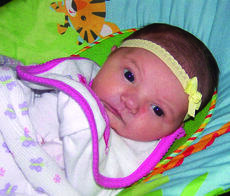 EmmaLeigha Wayne Nicole Kelly was born to Katherin Kelly of Cynthiana on Jan. 27, 2009 at Harrison Memorial Hospital. She weighed 7 lbs. 9 oz. Maternal grandparents are Tonya and Richard Tibbits and Earl Kelly, all of Cynthiana; maternal great-grandparents are Larry Florence of Lexington, Ky. and the late Eunice Florence, and Doris Kelly of Cynthiana and the late David Kelly. The Young Farmer Chapter held their regional banquet on Feb. 4 at Golden Corral in Georgetown. The local banquet is planned for March 23 at the Harrison County Extension Office. Brian Furnish with the Burley Co-op will be the speaker at the Feb. 9 Harrison County YFC meeting. Jaylen Rae Shadd was born to Joseph L. Shadd and Jessie L. Jones of Cynthiana on Dec. 22, 2008 at Harrison Memorial Hospital. She weighed 9 lbs. 9 oz. Maternal grandparents are Melvin and Kathy Jones of Cynthiana; maternal great-grandparents are the late Simon and Bertha Jones of Newport, Ky., and the late William T. and Lillion Barnes of Cynthiana. Paternal grandparent is Dallas Shadd; paternal great-grandparents are the late William L. Shadd and Rosemary Shadd. It seems we are in the middle of yet another “situation,” as my husband calls it, served up by Mother Nature. At present, we are right in the middle of the mess out at the farm. No electricity, no phone line, no heat and no water. The ice storm and snow have left a path of downed trees and limbs. The Sunrise Homemakers Club continues to be a strong and active club--formed in 1946. Margie Rainey was one of the 21 that formed the club and is a Charter Member of the Harrison County Homemakers. Present membership is 22. This year five new members were welcomed. They are Peggy Barlow, Janice Griffin, Marilyn Moss, Shawna O’Brien, and Sherry Williams. 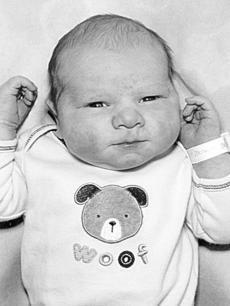 Births announced this week are: Emily Marie Earlywine, Jan. 29, daughter of Nina Earlywine and Larry Earlywine; Dustin Ray Morris, Feb. 2, son of Stephen and Michelle Morris; Alexandra Noelle Tumey, Dec. 17, daughter of Jessica and David Tumey. Rylan Wynter Stroub was born to Shawn and Aliceson (Trimpe) Stroub on Nov. 28, 2008 at Saint Joseph East Hospital in Lexington. She weighed 7 lbs. 3 ozs. Paternal grandparents are Charles Bradley and Kathy (Honeycutt) Stroub; paternal great-grandparents are Mary Jean Anderson and the late Herbert Hoover Stroub and Mary (Osbourne) Northcutt. 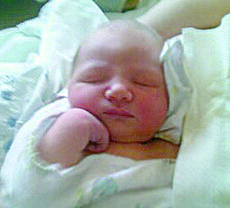 A daughter, Brooke Mackenzie Bush, was born to Lisa and William Bush of Wauconda, Ill. on Dec. 1, 2008. She weighed 8 lbs. Maternal grandparents are Claudia and Alan Kostrzeski of Mt. Prospect, Ill.
Paternal grandparents are Laura Jane Bush of Cynthiana and Donald C. Bush of Edwardsville, Ill.
Korbyn Blake True was born to Josh and Nikie True of Cynthiana on Oct. 21, 2008 at Central Baptist Hospital, Lexington, Ky. He weighed 3 lbs. 10 oz. Maternal grandparents are Mark and Cindy Ritchie of Carlisle; maternal great-grandparents are the Rev. Howard Livingood of Carlisle and the late Stella Livingood and Randall Ritchie of Carlisle and the late Nancy Ritchie. 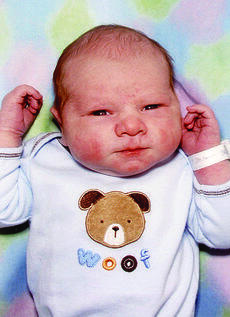 Jaxton Blake James was born to Calvin James of Georgetown and Trista Milner of Cynthiana, on Nov. 29, 2008 at Georgetown Community Hospital. He weighed 9 lbs. 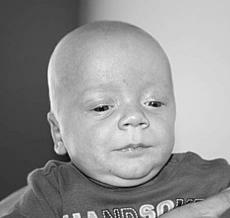 3 oz., and is welcomed by his brother Jayden Scot James. Maternal grandparents are Tracy Milner of Cynthiana, and Mr. and Mrs. Rodney Milner of Berry, Ky.; maternal great-grandparents are Mr. and Mrs. Jerry Gill of Cynthiana, and Mr. and Mrs. Bill Milner of Berry; maternal great-great-grandmother is Jeanie Garrett of Foster, Ky.
4-H Club Officers have been elected for 2009. These officers have received training at the Harrison County 4-H Club Officers Training held in November at the Harrison County Extension Center. These officers will be in charge of their monthly 4-H club meetings for 2009. Paternal grandparents are Dr. and Mrs. Luther C. James of Georgetown. The Kentucky 4-H Centennial is a momentous occasion for the organization that has made a positive, lasting impact on the lives of hundreds of thousands of the state’s youth over the years. To kick off a year of celebration, 4-H is planning a birthday bash. It will be Feb. 21 at the Hyatt Regency, Lexington.